There is a season for sowing and a season for harvesting. This is a foundational concept for farmers. Although we think of fall as harvest time, it is also the time to sow and grow cool season crops. Tall fescue is the number one cool season perennial grass in Caldwell County. Most are familiar with Kentucky-31 or K-31. After 80 years, K-31 is still the most popular tall fescue variety sold to date even though there have been hundreds of improved turf and forage varieties released. K-31 is the most common grass found in lawns, pastures, hayfields, roadsides, etc. Basically, if you see grass growing in Caldwell County, there is a good likelihood it is fescue or fescue is a major component of the grass mix. Tall fescue is a tough grass, it grows well in Caldwell County, and more tall fescue is planted each year than any other grass species. So, it makes sense that K-31 is the most common grass. Cool season grasses, like K-31, grow best when the weather is mild. Cool season grasses are a large group that includes annual small grain crops like wheat, oats, and barley, as well as annual forage grasses like ryegrass. Perennial cool season grass includes tall fescue, orchardgrass, and bluegrass. All these grasses grow best when it is cool, so these grasses grow best in the Spring and Fall. For those managing K-31 as turf, August is the month when it will look its worst. The grass has been getting beaten up by the heat of the summer and may have gone dormant. Dry weather has not been a problem this year. However, the plentiful rain has increased the disease pressure. Brown patch is the major disease every year for tall fescue and is especially evident this year. Leaf wetness is needed for Rhizoctonia solani, the brown patch causing disease organism, to infect the leaf, and we have had plenty of leaf wetness this summer. When cooler temperatures arrive in September, tall fescue will put on new growth, the old brown leaves will be replaced with new green leaves, and it will look much better. Since fescue is growing in September, it is also is a good time to fertilize. Fertilizing around the first of September helps fescue take advantage of the good growing conditions. September is also a good time to plant fescue. Some lawns just need a little help, and they can be overseeded rather than completely renovated. Overseeding fills in all the little spots in the lawn where fescue has gotten thin. Tall fescue does not spread like some other grasses such as bermudagrass. It can only spread by seed. Any holes or bare spots have to be seeded to fill in bare areas. The key to a good planting is seed-soil contact. The seed must be in contact with the soil to germinate. One way to achieve good seed-soil contact is to plug or aerate the lawn. This opens up the turf and allows for good seed-soil contact by punching through the sod and opening up places for seed to contact the soil. When managing tall fescue pastures and hay fields, the same concepts apply as those with turf. Fescue still grows best in the spring and fall, fertilize just before good growing conditions in the spring and fall, and good seed-soil contact is still needed for germination. The biggest difference between managing for turf and managing for hay or pasture is how frequently the grass is mowed, clipped, or grazed. Think of the grass leaves as solar collectors (which is exactly what they are). The bigger your solar collectors, the more energy is collected. More energy equals more grass, and more grass equals more pasture for animals to eat. There is an interesting way farmers can exploit this dual concept of tall fescue growing in the fall and the leaves acting as solar collectors. This dual concept is sometimes called deferred grazing or, more typically, stockpiled grazing. Whatever this is called, there are three practical steps to stockpiling fescue. The first step is to remove the old leaves by grazing or mowing fescue down to 4 or 8 inches. Then fertilize with 40 to 60 units of nitrogen fertilizer. And the last and most important step is to wait. Waiting is often the toughest part. Our minds are sometimes focused on instant gratification, but waiting is essential to let the grass grow. During September, October, and November we should have good weather to grow grass. Give the grass a chance to grow and accumulate during these three months. Waiting until December or January is a good target to start grazing this accumulated forage. Waiting allows time for maximum accumulation of fescue. And since the weather has gotten cold, the grass is kept “fresh” as if it were put into a refrigerator. 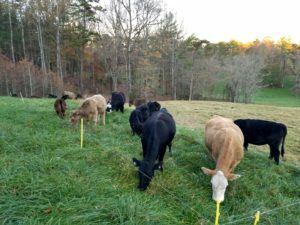 Experiments with stockpiling fescue in Caldwell County and across North Carolina have demonstrated this is an excellent way to extend the grazing season. The quality of fall stockpiled fescue is excellent and better than fescue hay. Stockpiled fescue will more than meet the needs of mature cattle and most lactating cows. Heifers on stockpiled grass alone can gain two pounds per day without additional feed. Data from these experiments have shown that one acre of stockpiled fescue will feed a 1,000-pound animal from the first of January through March if controlled grazing is employed and we receive normal rainfall. This also assumes the stockpiling starts September 1 with 60 units of N fertilizer. Starting the stockpiling earlier yields more tonnage, but with lower quality. Stockpiling that begins after September 1 will have slightly higher quality but less quantity. While waiting for the grass to grow and stockpile in the fall, this is when hay is fed during the warmer months – September, October, and November. Then in December or January, the animals return to grazing. There are lots of things about this system that should be considered for a particular farming operation. If you would like to learn more about forages and deferred grazing, then make plans to attend the next Caldwell County Cattlemen’s Association meeting on Tuesday, August 28. It will be at a local farm. For details, contact the Caldwell County Extension Center at 828-757-1290. First, evaluate your pastures. Some are probably overgrazed and the fescue is weak or completely gone. Hopefully, some pastures still have fescue (and other cool-season forages) at least 3-4 inches tall. Evaluate all your pastures and put them in one category or the other. Pastures in the first category, thin and over grazed, should be re-planted in fescue or fescue mixed with other cool-season forages. September is the month to plant tall fescue, orchardgrass, etc. To learn more about the establishment of pastures visit the Forage and Grassland Management website. Here you will find information to re-establish your permanent pastures. Ask your local Extension Agent for help with your particular situation. Each farm is different and they will give tailored advice for your operation. Be sure to take a soil test too. This is the best way to determine fertility – lime & fertilizer – requirements. Pastures in the second category, good fescue 3-4 inches tall, are ready to go to work. When it rains, they will come back and be productive this fall. For maximum growth apply 60 to 80 units of nitrogen along with additional requirements as indicated by a soil test. It is best to fertilize now in September. With either situation, overgrazed thin pastures or good fescue minimum 3-4 inches tall, it essential that these pastures rest. Animals must be removed. If pastures are not allowed to rest, they are not as likely to recover and become productive. Move animals to sacrifice areas and feed hay now. If your animals are not able to get a full bite of grass on the pasture, you’ll be feeding hay anyway. Put them up in an area and let your pasture recover until January 1st. Beef cattle grazing stockpiled tall fescue. A temporary fence is used to keep the cattle trampling the grass. The animals get a new patch of grass each day. This strategy of feeding hay now and grazing later, gives pastures a chance to recover. However, this all depends on rainfall. The current best prediction is we will have a wet fall since El Niño is in full effect in the Pacific Ocean. Letting fescue (or other forages) accumulate is called stockpiling or deferred grazing. It is a technique that has been used very successfully for many years.